Alan Edward Gorrie was born in 1946, in Perth, Scotland. He went to Dundee Art School and played bass guitar. Alan loved the blues and in 1966 co-founded the Blue Workshop in Perth as a place where musicians could interchange line-ups and explore the free form side of jazz, blues and soul. The Blue Workshop was held at The County Hotel, in County Place, Perth in their upstairs function suite. It was also the home of Perth Folk Club. There was limited opportunity for like-minded musicians to play together outside paid gigs, which were mostly mainstream. The Blue Workshop allowed them to jam and listen to new albums, not commonly available in the UK or played on the radio. 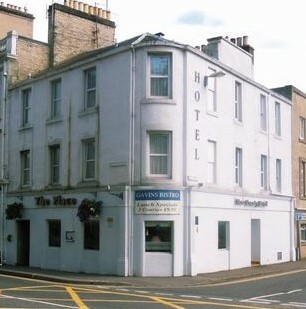 Regulars included Alan’s college mates, Malcolm ‘Molly’ Duncan and Roger Ball, (later dubbed the Dundee Horns by Maggie Bell); Jim Mullen (double bass); and a 17 year old Robbie McIntosh (1950 - 1974) on drums. Sixty miles away in Glasgow, Onnie McIntyre and Hamish Stuart played at the late night, blues /soul venue, the Picasso Club, Glasgow. By 1967, Alan Gorrie and Onnie McIntyre had joined forces in the Scots of St James, and worked mainly as backing for visiting American soul artists. They also toured Germany playing clubs and US military bases but failed to catch attention with their vinyl releases. In 1970, Roger Ball and Molly Duncan joined a jazz rock band called Mogul Thrash and released and album and single, "Sleeping in the Kitchen.” Neither attracted much attention in the UK but sold respectably well in Europe. Mogul Thrash disband shortly after the record's release. Robbie McIntosh had joined the white soul band, the Senate, and backed touring acts like Ben E. King, Solomon Burke, Big Maybelle, and Garnet Mimms. He left to join The Brian Auger’s Oblivion Express with Jim Mullen, The initial Brian Auger's Oblivion Express album was released in 1971, listening to it you can begin to hear the genesis of the AWB. Meantime, Alan Gorrie (bass guitar, piano, vocals), Onnie McIntyre (guitar and vocals) and Stuart Francis (drums) formed Hopscotch and the line-up was completed with Hamish Stuart (vocals) and Graham Maitland (piano/vocalist). Hopscotch released two singles but neither would chart. Hamish Stuart left to form Dream Police in Glasgow. Dream Police quickly became one of Scotland's bigger crowd pullers along with Chris McClure Section, the Poets, the Stoics, Tear Gas and the Bay City Rollers. Despite their obvious appeal the band had little or no commercial success with their singles and gradually began to break up. 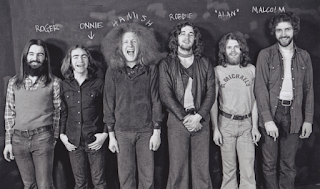 Hamish quit to form Berserk Crocodiles with Matt Irvine (keyboard and vocals), drummer, Wullie Munro (Tear Gas) and Frazer Watson (Trash) in late 1970/1971. After Hopscotch disbanded, Gorrie, McIntyre and Francis formed Forever More, with Mick Strode (aka Mick Travis) on guitar. The progressive rock band was based in London, under the management of managed by International Artists. They toured extensively both UK and Europe. When not on tour, their contracts allowed them to work at pubs, clubs, concert halls, and festivals; and as session musicians in various studios in London. In 1972, McIntyre and McIntosh record live with Chuck Berry at The Lanchester Arts Festival and it was released as The London Sessions featuring Chuck’s first and only UK No.1 single 'My Ding-A-Ling'. The group appeared as a band pursued by groupies in Lindsay Shonteff's cult hippie movie. Permissive (1970) and produced two RCA albums: "Yours" (1970) and "Words on Black Plastic" (1971). The former made the lower end of the American Billboard Charts. Gorrie and co were so happy with the results they decided to form a band. The new line was : Alan Gorrie (singer and bass), Onnie McIntyre (rhythm guitar, backing vocals), Roger Ball (sax, horn arrangements, keyboards), Malcolm “Molly” Duncan (tenor sax) and Mike Rosen (trumpet), and Robbie McIntosh (drums). Michael Rosen was quickly replaced by Hamish (Black Throat) Stuart. Robert Stigwood suggested Robin Turner as their manager and actor (Sir) Stanley Baker financed the project. It was Alan’s idea to bring the band together but unmistakably Robbie drove their sound and they were soon catching attention with a tight, soulful sound. The band literally introduced The Metropolis to white soul music but were lacking a name. The band appeared at The Great Western Express Festival. Bardney. 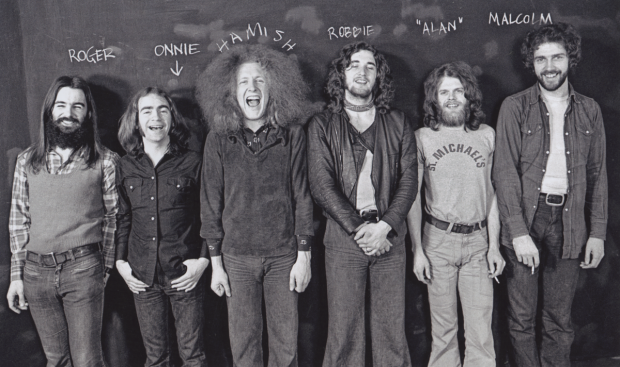 Lincolnshire in 1972, as the Average White Band. The name had started as an ‘in joke’ but just stuck. Bruce McCaskill (Eric Clapton’s tour manager) acquired a recording of the band rehearsing and played it to Bonnie Bramlett, who was looking for funky band to back her on her debut solo album, Sweet Bonnie Bramlett. She had the band fly out to out to Los Angeles for six weeks in the summer of 1972. Once in LA, the band indulged themselves in the music culture and made some very influential friends. They arrived back in London full of ideas and armloads of potential new material. In 1973, AWB were invited to be the support for Eric Clapton's comeback concert at the Rainbow Theatre in Finsbury Park, London. The band earned rave reviews and were immediately signed to MCA records. Bruce McCaskill, agreed to become their manager and their first album, Show Your Hand was released later the same year. After the album failed to catch much attention, Bruce McCaskill borrowed money and took the group to the LA, where they started to record their follow up album. When MCA turned it down, Jerry Wexler heard the tapes, and signed them to Atlantic Records. He allocated producer, Arif Mardin to oversee them in Miami's Criteria Studios. The album was finished at Atlantic Studios in N.Y., where Gene Paul was assigned as the engineer best equipped to capture their sound. They adopted the abbreviated moniker AWB and The White Album (AWB) was released in October, 1974. The single, “Pick up the Pieces,” an instrumental, went to #1 on the Billboard Pop chart, but this would be a bittersweet moment for the band, for just prior to its release, on the last night of a triumphant week at The Troubadour, Robbie McIntosh died of a drug related incident at a celebratory Hollywood party in September 1974. The single had been released in the UK in July 1974, but failed to charted, when if was re-released a year later, it climbed to number six. Scotland’s blue eyed soul boys had arrived in America and as both a tribute to their knowledge of funk and a tongue-in-cheek play on the Scottish band's name, The J.B.'s, (James Brown’s backup band), released "Pick Up the Pieces, One by One", under the name AABB (Above Average Black Band). What a tribute. For their third album, ‘Cut the Cake’, Steve Ferrone (Bloodstone and Brian Auger's Oblivion Express) replaced Robbie McIntosh. It was never going to be an easy job to complete this album as naturally feelings were high and progress was plagued by creative and artistic differences. After several members of the band walked out of the studio Arif Mardin considered pulling the plug on the project, but presevered and the final album was dedicated to Robbie’s memory. ‘Cut the Cake,’ topped the Billboard R&B Chart and reached Number 4 in the US Album charts. The title track reached #10 on the Billboard pop singles chart and “Schoolboy Crush,” and “If I Ever Lose This Heaven,” also charted. Until they appeared on Soul Train many people thought they were an African American soul band. The record company issued’ ‘Put It Where You Want It’ in 1975 , but this was a repackaged Show Your Hand . "How Can You Go Home" replaced Jugglers in the reissue and the album peaked at #39 on the Billboard Top 200. “Soul Searching” was released in 1976 and went to Number 9 in the US album charts as well as going platinum. The singles did less well, with "Queen of My Soul," reaching number 21, and the other stand out track "A Love of Your Own," failed to make the Top 100. In 1976, the group released a live album entitled “Person to Person” to showcase their live abilities. The following year, they were invited to join the Atlantic All-Stars at the highly-regarded Montreaux Jazz festival in Switzerland. Benny & Us, was a collaboration with soul legend Ben E. King, in 1977. They met while the band were on vocation in Miami and decided to combine their talents. The album is both soulful and funky and became Ben E King’s best selling album, rising to number 33 in the US charts. The double A side, "A Star in the Ghetto"/"Keepin' It to Myself" made respectable showings on the R&B singles charts, Unfortunately the joint tour which had been tentatively planned fell through but Ben E King and The AWB did appear at some live performances. “Warmer Communications” was released in 1978 and reached 28 in the US album charts. The title was wordplay on Warner Communications, the parent company of AWB's Atlantic Records label. It is considered by many fans, to be the last great album the group produced. “Your Love’s a Miracle,” was the single from the album and made a respectable 33 in the Billboard's R&B singles chart. By the time “Feel No Fret,” was released in 1979 AWB were beginning to loose their poularity in the US, as musical tastes changed. None the less the album reached 32 in the US charts and peaked at No. 15 in the UK charts. Singles, “Walk on by,” and “"When Will You Be Mine, " made it to the lower end of the Top 50 singles and “Atlantic Avenue” (sic. my personal favourite) failed to chart, Stateside. The group dissolved in 1982 and band members went onto pursue solo careers. Steve Ferrone joined Duran Duran, Hamish Stuart joind Paul McCartney and Alan Gorrie released a solo album, Sleepless Nights in 1985. Alan Gorrie, Roger Ball, and Onnie McIntyre, did reform the AWB in 1989 and the line up was completed with Alex Ligertwood (Santana , Jeff Beck Group and Brian Auger's Oblivion Express) who replaced Hamish Stuart on vocals, and Eliot Lewis (keyboards, drums and programming). Together with invited guests, Chaka Khan and the Ohio Players, they recorded Aftershock. Ligertwood left after the album's recording and drummer Tiger McNeil (1989–1994) joined the reunited band for their live shows. Average White Band continued to tour and record: Soul Tattoo (1997), and Face to Face (1999) without rekindling their earlier successes. Alan Gorrie and Onnie McIntyre are the only remaining original members of the band, but as of 2016, forty years after their formation, they continue to perform. AWB became arguably the most successful Scottish band of the 20th century. Not only did they master the soul sound of contemporary North American music they developed their own blend of funk and soul which made them one of the few white groups to credibly cross the colour line. In achieving this spectacular goal they have influenced countless others, and have been sampled by many musicians in the late 80’s and early 90s, making them the fifteenth most sampled act in history. ‘The Team,’ from their humble beginnings in Scotland, were well above, the Average White Band.